Nolensville, TN, March 13, 2019 --(PR.com)-- Wheeler’s Raid Distillery is pleased to announce the general availability of their ready-to-drink canned cocktails in the middle Tennessee market. 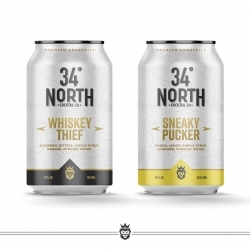 The distillery has launched their line of premium canned craft cocktails under the label "34 North Cocktail Co." The spirits based craft cocktails come in 12-ounce cans as a 4-pack and are crafted with high quality spirits and no artificial ingredients. The company has launched two cocktails, one bourbon based that will drink just like an old fashioned that is 15% ABV the other, vodka based with lemon and lavender that is 12.5% ABV. “These cocktails aren’t sugar bombs in a can, they taste just like one made behind a bar,” says president of the distillery, Ryan Thomas. Thomas also said the distillery spent nearly a year developing each cocktail and they have been crafted with a high degree of focus on taste and quality. The distillery’s business model is to create cocktails that mirror those made by professional mixologists at any of middle Tennessee’s trendiest bars. The distillery is confident that customers are really going to enjoy the convenience and premium quality of these cocktails. The distillery’s name pays homage to the civil war battle that swept through the Nolensville area back in 1863. General Joseph Wheeler led his troops to intercept a supply line of wagon wheels that were full of whiskey barrels. The battle eventually crossed the 34 degree longitude marker which is where the “34 North” distinction comes from. The 34 North Cocktails will be available in most retail liquor stores throughout Middle Tennessee starting the week of March 9, 2019. The distillery also boasts a beautiful tasting room and music venue located in Nolensville, Tennessee that is open Thursday through Saturday every week. Each weekend, Wheeler’s will have live music playing on their new stage and has recently invested in a concert quality sound system. In addition to the tasting room and music venue, Wheeler’s also offers private and public tours of the distillery Wednesday through Sunday. You can check the company out at www.34northcocktails.com or www.wheelersraid.com and on Facebook and Instagram @34Northcocktailsco and @wheelersraiddistilling for more information on events and tours.